What is your office reception design saying about your company? Do first impressions really count? Research tells us that it takes a maximum of 7 seconds for someone to form an opinion of your company from your office reception design. Whether we call the phenomena “thin slicing”, “rapid cognition” or “intuition”, it is true that our subconscious mind will make snap judgments that can either fortunately or unfortunately change a situation in under 7 seconds. 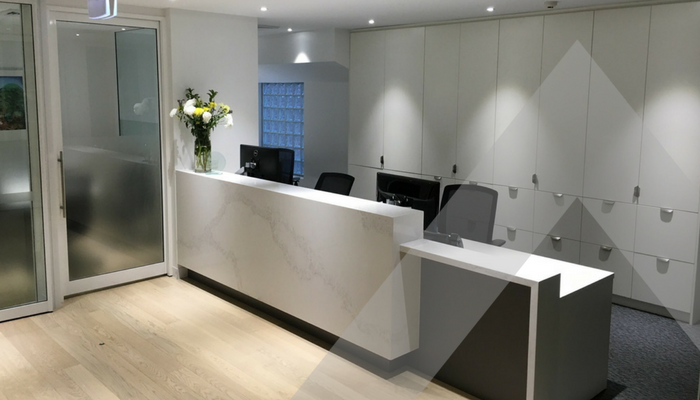 An office reception desk is the front line of your operation. It is the very first thing a client, a customer, a supplier, a potential employee or an investor will see and you have only 7 seconds to make a good impression. Does your office reception design pass the 7-second test? If not, we have listed the top 10 considerations for the design or re-design of your office reception area. 1.How many staff are likely to be on the counter at any one time, both now and into the future (the term of your lease)? Long with multiple receptionists assisting multiple visitors in perpendicular lines? 2. How many visitors will you have, and what type? For example, couples or families will happily sit together on a 2 or 3 person couch, but if most of your visitors are business people, you’ll find they’d be far more comfortable on separate chairs. If you expect many visitors at the same time, you will need to allow for ample seating in the reception area and allow for wheelchair access and turning. If you expect families, it might be an idea to set aside an area for children’s toys or books to keep them occupied whilst waiting. 3. Will the receptionist be accepting and sending out mail? If so they will need desk space to do it and possibly even space for a franking machine. Typically for large professional services firms. It is important to allow the space for such a duty whilst also building a screen so that visitors don’t see a messy working desk. 4. Will the receptionist need to be able to unlock the entry door without getting up? Security is paramount in any office situation, some offices may remain locked 24 hours a day. During working hours, the front door or reception can be operated by the receptionist and in this case, it is important to consider an unlocking mechanism close to the receptionist to prevent them getting up and down each time a visitor is at the front door. 5. If your receptionist is isolated most of the time from other staff, should you consider a duress alarm? For situations where reception staff are isolated, there are extra considerations such as an easily accessible duress alarm or video cameras in the reception area to ensure the safety of reception staff at all times. 6. Does your receptionist need to have a space to do confidential filing, ie lockable cabinets, and a private space? 7. Will your receptionist offer refreshments? If so take this into consideration in the design. It is important to ensure that the receptionist has full view of the reception area at all times. An office kitchen is usually far away from the reception area so you may need to consider an area for drinks, a coffee machine, a water cooler and the associated crockery and glassware. Of course, in this situation, you will also need to consider an area where used crockery and glassware can be stored (ie hidden) from view before it can be taken to the kitchen. 8. Does your proposed reception area have a space for people to sign in and out? Are there multiple sign in books? Are they easily accessible for visitors? Is there correct signage making it clear to visitors that they need to sign in? Are the badges good quality and reflective of your operation? 9. Reception design considerations for disabled access. In addition to allowing access for wheelchairs in the reception area, you must consider the height of the reception desk. Having a low section on the desk where a wheelchair can pull in gives your visitors the dignity they deserve. 10. What kinds of deliveries do you normally take in the reception area? You may wish to consider a separate and designated area of the reception desk for couriers and their deliveries. This will keep the main area of the reception free from boxes and deliveries. What type of look are you after? Modern, traditional, art deco? Materials for the counter top? The type lighting you would like? Incorporating your company brand and colour palette? With examples of previous work and years of experience, we can assist you to ensure your first impression is exactly the one you want to make.